Using a racquetball glove during your racquetball game can improve your game play experience by far. It helps you grip well, increasing your control over the Racket. Also, they prevent slippage of the Racket due to sweat. They are generally unisex and designed with flexibility for men, women, adults, and children. Low price gloves might compromise quality. Cheap gloves generally go for fewer days than the expensive ones. Look for the best Racquetball gloves when buying because your game play and comfort depend on it. Even well known manufacturers can have a bad batch of gloves sometimes. But the general rule of thumb is, the gloves that are more expensive and coming from brands tend to last longer. One of the reason is expensive ones are made of quality materials, like sheepskin leather. And who doesn’t know, you get what you pay for. Tackified leather provides maximum adhesiveness, but that also means they are tough to switch between hands. On the other hand, synthetic leathers are not as sticky, but enough to control the Racquet. Also, they provide the facility of switching the Racquet between hands quite easily. Getting padded gloves is a good idea for those who dive a lot during gameplay. But padding comes at the cost of breathability and adds extra weight on the hands. Breathability allows your wrists to stay dry as the airflow runs through the gloves. But generally, that also means you’ll get less padding and absorption. Mesh backings are more breathable. On the other hand, Lycra or neoprene is less breathable, but they absorb better and always a better fit. So choose your gloves according to your preferences. As mentioned earlier, expensive gloves tend to run for a longer period. That doesn’t mean you should rule out the cheaper ones. Another option is for you to keep several pairs of cheap gloves. That allows you to change the gloves after every match and switch between them. Racquetball gloves generally come unisex. But make sure they are a good fit. Too tight gloves will make you uncomfortable, not to mention hinder your natural gameplay. Too loose gloves will make it difficult to control your Racquet. That’s why, go for a good fit, not too tight, not too loose. Want to flex your fingers and get a good tight grip without any problem? The E-Force Weapon Racquetball Glove comes with features like 'little finger' and full leather ring finger to ensure that. The gloves are durable with Cabretta Sheepskin that is 0.6 mm thick. The sheepskin also helps maintain the shape. The Stay Soft tanning process keeps the gloves dry for a longer period and maintains the softness. One of the best racquetball gloves for sweaty hands. Comes with an attractive red/black color combination. Three sides of each finger are covered with leather panels, which increases durability. The thumb comes with a set-in design to provide free movement and comfortable feel. A great product for those who are an aggressive type of players and dive a lot. 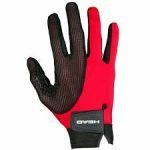 This glove comes with features like 'little finger' and full leather ring finger to ensure perfect adjustment with your fingers. The gloves are durable with Cabretta Sheepskin that is 0.6 mm thick. The sheepskin also helps maintain the shape. The Stay Soft tanning process keeps the gloves dry for a longer period and maintains the softness. One of the best racquetball gloves for sweaty hands. Comes with an attractive red/black color combination. Three sides of each finger are covered with leather panels, which increases durability. The HEAD Web Racquetball gloves is made with high performing COOLTECH technology to achieve highest air circulation, comfort, and cooling. It has got very comfortable padding system, there are pads at the knuckle to increase protection. It has microfiber COOLMESH that provides breathability even in the most intense weather. The palm is designed with silicon web palm pattern. Having a good grip and longevity is no longer a headache when you have the HEAD Web racquetball glove for your racket game. Brilliant air circulation, cooling and comfort. Provides breath ability even in the most intense weather. Comfortable padding, also pads at the knuckle to increase protection. The palm is designed with silicon web palm pattern. Well known for good grip and longevity. ​The Optima Max Grip Cabretta Leather Racquetball Glove is naturally tacky. So players find it easy to grip the racquet well. However, it’s not that sticky which causes a problem in switching the Racquet between hands. The product is significantly cheaper. The thin Cabretta sheepskin provides durability to the user. The stay-soft rubber ensures the gloves are not harsh on your wrists. The reinforced dual coating palms ensure that you get maximum control over your game. Also, the breathable mesh backing helps to keep your hands dry and cool. Easy to grip the racquet well. However, it’s not that sticky that can cause problem during switching the Racquet between hands. The product is significantly cheaper. Thin Cabretta sheepskin provides durability. Breathable mesh backing helps to keep your hands dry and cool. The stay-soft rubber ensures the gloves are not harsh on your wrists. The reinforced dual coating palms ensure that you get maximum control over your game. One of the best products on the market in terms of quality and comfort. The Bionic Men's Right Hand Racquetball Glove was designed by an orthopedic hand surgeon to ensure the gloves have proper grip, moisture control, and protection. Made of goatskin leather which is washable. The leather is known for grip and longevity. Also, there are paddings on the knuckle to protect the player from floor and wall impact. A great product for aggressive players. The ergonomic pad system designed by a surgeon makes the hand surface even. The pre-rotated design ensures a lighter, stronger grip to improved control over the game. There are terry clothes mini-towel inside the glove and wristband. These clothes absorb moisture to keep your hands dry and provide the wrist added support. This might not be the cheapest option in our list, instead one of the best. The HEAD AirFlow Tour Racquetball Glove is popular among players due to its ability to keep your hands dry and cool. Its finest perforated Cabretta leather on the palm allows maximum airflow through the gloves. For knuckle protection and proper ventilation, airprene is used. The nylon mesh Lycra is used at the backing to provide more comfort. The product comes with a beautiful color design, a nice combination of white, black and brown. Popular among players due to its ability to keep your hands dry and cool. One of the finest perforated Cabretta leather allows airflow through the gloves. For knuckle protection and proper ventilation, airprene is used. The nylon mesh Lycra used at the backing provides more comfort. Beautifully designed, combination of white, black and brown. 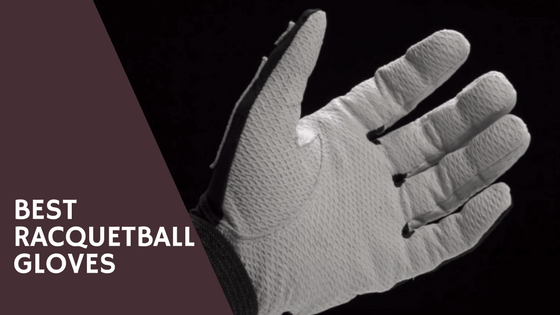 Are Racquetball Gloves washable? How to clean your racquetball gloves? Yes! Racquetball gloves are washable. Most racquetball gloves are made of synthetic fabric and foam paddings. So they can easily absorb and discharge water if you try to wash them. Other than synthetic gloves wash ability depends on the material it is made from. It is better not to wash the leather ones as they can be damaged by water. If your glove starts to feel heavier, sticky, looks unclean or got dirty by any other way then you should consider cleaning them. It is a very natural thing that your gloves can get dirty after using for a while. Soap & water wash is the best way to clean properly. Make your old glove good as new just by washing them properly. To make a good cleaning at first soak your gloves in water for about few minutes before using detergent soap. After that make a soap solution that can fit your gloves and leave the gloves soaked in that soap for around 15 to 20 minutes. Apply slight pressure on the areas if strong stains are left. As next step rinse off all the soap with clean water. Make all the water drain out leave for drying up. Your gloves will feel almost as good as new from a proper wash. No matter how hard you try to maintain your gloves it gets dirty after using a while. Therefore washing them is almost like part of your maintenance process for your racquetball gaming. Those who don’t like to lose control over the game just because their hands are sweaty, welcome to the club. Wearing gloves will not only help you grip your Racquet, it will help you to absorb impact, especially if you’re an aggressive player and tend to dive a lot. We have discussed the best Racquetball gloves so that you find your options with ease. Remember, while there are gloves which come with amazing sweat absorption capability, it’s natural that they reach to their limit if you play for extended periods. To avoid downgrading your performance over time, keep spare hand gloves in your bag. Manufacturers generally come with offers and discounts if you buy in bulk. It always cost effective to purchase multiple gloves and keep extra options.